As mentioned in an earlier part of this chapter, the trait of territorial protective aggression has been valued in dogs since their domestication, and selectively bred for. This trait varies tremendously in dogs, from dogs who show absolutely no protectiveness to others who gladly attack to defend their territory and try to keep enlarging the territory they defend. 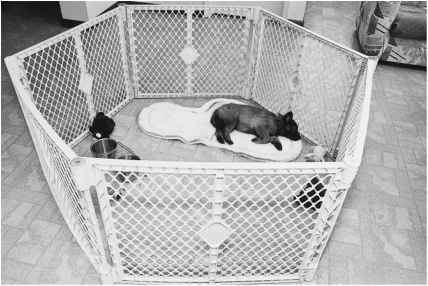 The development of territorial protectiveness in dogs is linked to sexual maturity. A dog is most easily guided into appropriate but not excessive protective behavior if the protectiveness is addressed at the time it first appears. 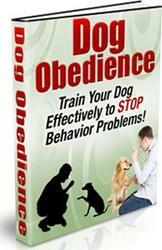 Owners of protective dogs have a responsibility to teach their dogs the limits of their protectiveness. Don't be reticent about putting limits on your dog's protectiveness for fear that he will cease all protection. You want to teach him what you consider threatening and what you do not. You also want to teach him that when you are home you will make the decision about who is permitted in your house and who is not. As described in chapter 8, barking problems are warnings of territorial protection problems. By controlling a dog's excessive barking, the owner takes the first step toward solving a territorial protection problem. he is accompanied by his owner. The fearful dog behaves aggressively toward strangers anywhere. Another mistake that people make with regard to protectiveness is the myth perpetuated by television and literature that dogs naturally protect their owners. Dogs will instinctively protect their territory, mostly preferring to drive intruders away rather than engage in a confrontation. They will protect themselves and their food and toys, but they rarely protect people, with the exception of when a child becomes a puppy substitute and is protected by a dog. Dogs are trained to attack people (and note that training is required to get a dog with a good temperament to attack people) by forcing the dog to attack to defend himself, or by making use of his instinct to kill prey. Dogs will guard their owners as a source of affection and food, much as they would guard a bone. Some owners mistake this for protectiveness. Dogs direct this kind of aggression at people and other dogs. Typically, the dog will be sitting on the owner's lap being petted when someone nonthreatening approaches. The dog then growls at the person to keep them away. The owner should promptly dump the dog off their lap, rather than being flattered by this behavior. This behavior can also look like jealousy, especially when a dog growls at another dog to keep him away from the owner's attention. The perfect guard dog is one who is confident around people and not afraid of them. In fact, he is very friendly with people. He barks when someone strange comes onto your property, but ignores children riding by on bicycles. He stops barking on your command, but continues to keep a watchful eye. If you say someone at your door is okay, he willingly makes friendly overtures to him or her. He would not allow anyone to enter your house when you are not home except for a few friends or family members he knows well. You feel secure when you are alone at home that you will be alerted if someone arrives, yet you are never afraid that your dog will bite someone when you have company. Because he is not afraid of people, if he ever does have to defend his territory, he won't hesitate. This kind of dog is the product of the right breed, good breeding, and good training.